The WalmartOne Associate website is Walmart’s primary online hub for all employees, new and old. The portal lets all employees, or ‘associates’, view their weekly schedules, paystubs, tax forms, benefits, and also allows users to change their contact information. Concurrently, the platform is the easiest way to request for time off, holidays, and to apply for jobs openings within the company. For more on accessing your schedule, visit Walmart Schedule. To access your paystub, see Walmart Paystubs. As the Walmart1 portal has grown, its success has also meant an increased complexity, and so, this guide aims to answer the pressing questions that new and older employees have relating to the platform. This includes up-to-date information on how to handle login problems, the WM1 app, PTO (Paid Time Off), Human Resources contacts and phone numbers, and much more. Note: Your PTO balance can no longer be viewed on WalmartOne. You will have to log i to the GTA module on Walmart Wire, to see your PTO balance. Locating the correct login page. The first problem that new employees face is simply to locate the correct WalmartOne login page. 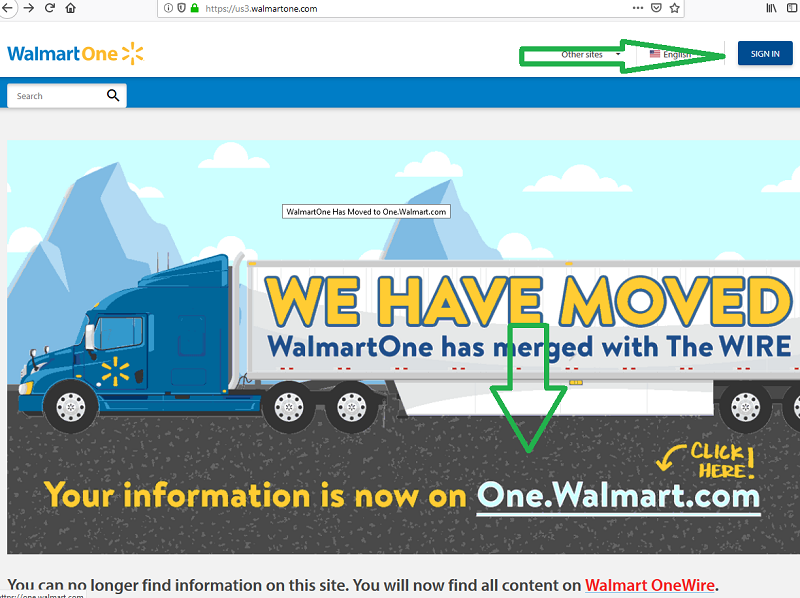 If you are logging in from a PC or laptop, then navigate to www.walmartone.com website and click on the blue ‘Sign In’ button on the top right hand side of the page. 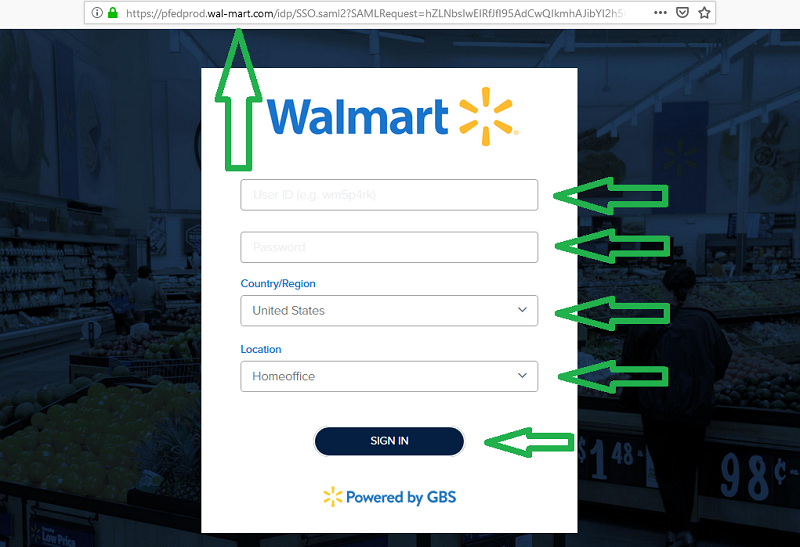 This will take you to the correct login page at the address https://authn.walmartone.com/login.aspx. 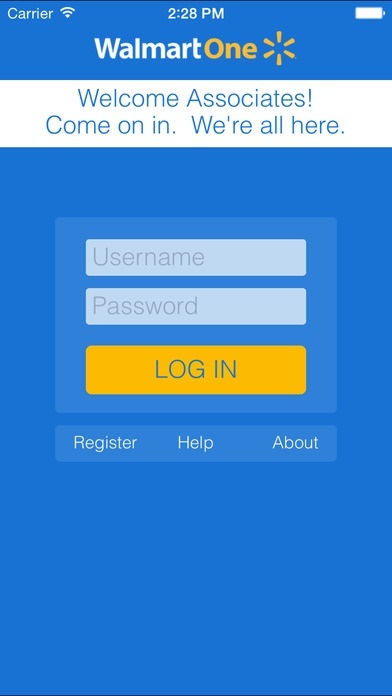 Then enter your login credentials, User Id and Password and click on the yellow ‘Login’ tab. The Walmart1 sign in page. 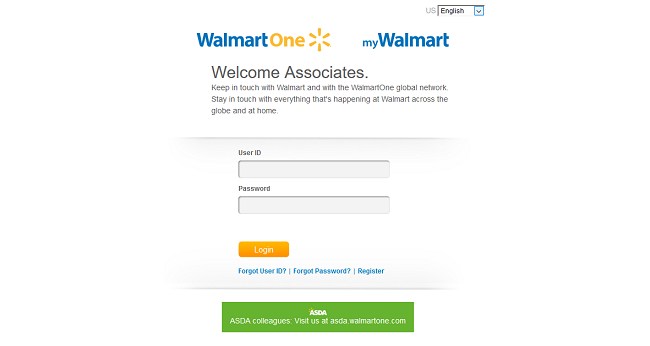 UK visitors (ASDA employees) will need to login from the ASDA WalmartOne login page. You can also choose to login to the associate portal by entering your User Id and Password at www.mywalmart.com. Recently, Walmart has merged their WalmartOne and Walmart Wire platforms, and moved everything to the new One.Walmart.com domain. The new portal has been named “Walmart OneWire”. This has caused some confusion among associates, as the ” if it ain’t broke, don’t fix it” adage may apply here. Nonetheless, Walmart has pressed ahead, and though you can still access WalmartOne through the old login link, Walmart now wants you to access through One.Walmart.com instead. The old www.walmartone.com domain asks you to go to One.Walmart.com instead. First, you will need have the 2-Step-Verification set up from inside a Walmart Store. Then, open One.Walmart.com in your browser, without “www”. www.one.walmart.com will not work. Click on the orange Walmart logo in the top left corner of the screen. A new login page will open. Enter your Walmart User ID and Password. The main change at One.Walmart.com is the new login URL, and Country and Location tabs. The User ID and Password are the same. Visit the WalmartOne.com login page. Click on ‘Register’ below the yellow ‘Login Tab’. On the next page, select your preferred language and click on ‘Go’. Enter your Walmart Identification Number (WIN), your birthday, the date that you were hired, and enter the CAPCHA code check. If you do not know your WIN number, then ask either your supervisor or visit the Walmart Wire website in-store. You will not be able to register for a WalmartOne account, now Walmart OneWire, until your information is in all HR systems. This takes a few business days, but might be after you receive your first Walmart paycheck. If you are a re-hire, you will need to register for Walmartone again, as former associate accounts are closed. To access the new One.Walmart.com website, or Walmart OneWire, you have to follow a 2-Step Verification process. You have to be at a physical Walmart location to sign up for 2-Step-Verification. You cannot sign up for the 2-Step-Verification from home. Please, be aware that you were never able to log in to the Walmart Wire employee portal from home. This is because, for security reasons, the Walmart Wire can only be accessed in-store, and it operates separately from the WalmartOne portal found at www.walmartone.com. Walmartone.com is used mostly for reading up on policies, schedules or interacting with other associates, whereas the Walmart Wire platform includes all self service Human Relations options. However, with the new One.Walmart.com, or Walmart OneWire, portal, Walmart have merged the 2 Walmartone and Walmart Wire platforms. Forgotten WalmartOne Password or User Id. Do not worry, resetting your WalmartOne password is easy. Visit the sign in page at www.walmartone.com and click on the ‘Forgot Password?’ underneath the login button and you will be taken to the password recover page on a seperate www.walmartbenefits.com webpage. Once there, enter your User Id and enter the CAPCHA code, taking note of upper and lower case letters. Your password will be either emailed to your email address on file or shown to you after answering your security questions. To recover your User Id, click on ‘Forgot User Id?’, and enter your email address and the User Id will be emailed to you. If you still cannot log in or you do not know the answer to your security questions, you can call the WalmartOne 1-800 support number on 1-800-421-1362, or if you cannot remember your username and password at all, contact Field Support at 1-479-273-4357. The WalmartOne app is also called the ‘WM1 App’. This is the name you need to search for in Apple’s iTunes shop and the Android Goolge Play shop in order to find and download it. The WalmartOne app lets associates log in to the Walmart One portal on-the-go from their mobile devices. The Android version requires Android 4.0 and up. The iTunes version requires iOS 7.0 or later, and can be used for iPhones, iPads and iPod iTouch. Note: The iTunes version has not been updated since 2015 and as a result has a series of bugs. Downloading the WM1 App and logging in. Locate the WM1 app on your app store and press install. Then, open the app on your mobile or tablet. Register and create a Walmartone User Id and Password, if you have not already registered an account. Click on the ‘Register’ link under the ‘LOG IN’ tab and register with your Walmart Identification Number (WIN), birth date and year, date or hiring, and email address. If you already have registered and have your login credentials ready, then simply enter the username and password on the login screen. You can also add a comment or question in the comment section on these pages. 2 Common WalmartOne Login Problems. 7 Forgotten WalmartOne Password or User Id. 8.1 Downloading the WM1 App and logging in. the walmartone website is terible, it never works ……. I can’t get my schedule on Wal-Mart One. Keeps saying my username and password is incorrect. Remember that WalmartOne User IDs and Passwords are case-sensitive. Try logging in from another device, with another browser or in “Incognito Mode/Private Browsing Mode”. If you have have forgotten your password, go to the WalmartOne login page and click on “Forgot Username”, and enter your User ID. If you have have forgotten your WalmartOne User ID, go to the WalmartOne login page and click on “Forgot User ID” and enter your email address. I can’t get the app to work, nor can I register from my laptop. This is so frustrating! really the walmart 1 page hardly EVER works! you can put in the code to get password 1,0000 times & it will constantly state wrong code??? BILLION DOLLAR COMPANY & CAN NEVER ,EVER GET WEBSITE RIGHT!!!!!!!!!!!!!!!!!!! The Billion Dollar Company this say it all that the dollar is more inportant then the workers, so thy make thing harder then needs to be – petty sad. I been trying for a week now to reset my password can not do it. my schedule is totally messed up. avalibilaty is till 11 pm and this last schedule all 5 days was till 12, 12;30 or 1am,,, Just crazy! My supervisor fixed it but Im hoping it doesnt continue! The whole Walmart1 website is terrible, you register one day, the next, it doesn’t even remember you. The site won’t let you back in. What a waste of time. I can get in at work but not home. please help! This new Website that they got. Can not log on at all. Whoever set this website up for walmart did a horrible job not happy with it at all. They just should have let it along. The Walmart one is not working for me. To get your W-2 electronically, log in to walmartone.com, go to “Money”, click on “Pay” and then click ” W2″. Continue to sign up for electronic delivery of your W-2. Alternatively, go to WalmartOne, then find your most recent paystub, and make a note of the gross pay number. Then go to: Mytaxform.com and enter the Walmart employer ID “10108”. Enter your SSN and your PIN. The PIN is the numeric digits of the gross pay number (no decimals). For example, your gross pay number on your last paystub was $3,831.15, then the PIN will be “3831”. You may have to verify your address. If you are a FORMER Walmart associate, you must contact the personnel office of the last Walmart Store, that you worked at. They will then mail you your W-2 to the last address in your file. They will retain it if it is returned, until June 30th. WE CAN NOT GET INTO OUR WALMARTONE. AND YOU ALL THINK IT IS GREAT. THERE IS NO ONE TO HELP. ALSO, ALL OF THE SO CALLED MY SHARE IS A BIG JOKE. IT IS ALL PUT ON ONE CHECK, SO WHEN IT IS TAXED WE ALL GOT NOTTING.SAME WAY WITH PTO AND THIS NEW MISS NO DAYS YOU WILL GET NOTHING. 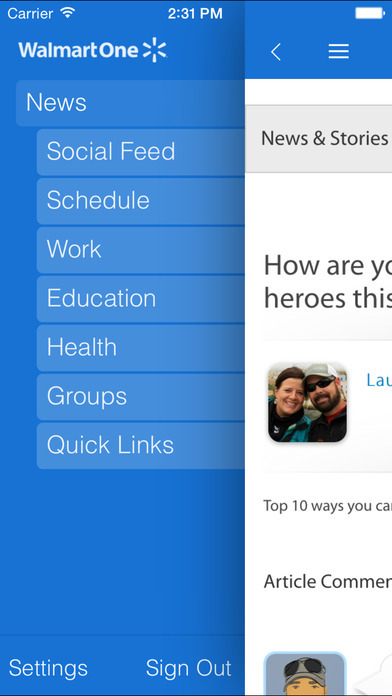 Log in and select the “Schedule” . Then, click on “Show Schedule”. How to see your schedule through the WalmartOne App: Download the WM1 app from the app store, open the app and click on “Work” to see your work schedule. Please help. I have spent 3 hours to log into my account ! It’s very difficult to log in on the WalmartOne site, I’ve been on the computer for 2 hours. Every window that I’ve attempted to open has been met with frustration and disappointment, for one I had to reset my password because it didn’t recognized the password that I had entered and for another whenever I go to the WalmartOne.com it states, ” the page that you are looking for has either been moved or the name has been changed” I don’t understand, so confusing I want the convenience not the headaches; therefore I will stick to the computers at work. Walmart Wire is harder than ever to log into, someone needs to fix this, NOW!!!!!!!! how the heck are you suppose to check your paystub at home anymore it was fine until they started this wire thing now I can’t access it from my home computer although I signed up at work for this 2 step stuff WALMART needs to update better the sites will not open all you get is the little spark twirling around and not opening up very frustrating !!!!!!!!! I have been trying to get back on Wal-Mart 1 from the time they updated it. It has been very difficult because of changes to my e-mail and the fact I have lost my password. I am happy after much research to find this site and phone number. I will be calling to rectify all of my issues. Thank You.